The Vietnam War required us to emphasize the national interest rather than abstract principles. It is not a matter of what is true that counts, but a matter of what is perceived to be true. Diplomacy...the art of restraining power. If the businessman would stop talking like a computer printout or a page from the corporate annual report, other people would stop thinking he had a cash register for a heart. No side will win the Battle of the Sexes. There's too much fraternizing with the enemy. Deep versed in books and shallow in himself. There comes a time in every rightly constructed boy's life when he has a raging desire to go somewhere and dig for hidden treasure. History knows no resting places and no plateaus. Every civilization that has ever existed has ultimately collapsed. 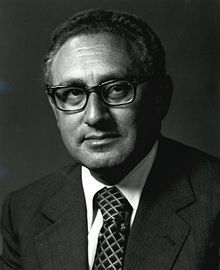 28 quotes by Henry Kissinger.